In the fall of 2018, Assistance League issued a call to action to all 120 chapters and chapters-in-formation to participate in a nationwide effort to raise awareness of the importance of promoting childhood literacy and putting books in the hands of children who might not have access to them. Coinciding with founder Anne Banning’s birthday on February 25, Assistance League Action! Week is officially celebrated February 25 – March 3, 2019. In low income communities, books and educational resources are scarce. Kids start school behind their more affluent peers and never catch up. A record number of kids are growing up in need. •More than half of U.S. public school students live in low income households. Public education and programs are deeply underfunded. •23 states are spending less on education than before the 2008 recession. Without adequate resources, children cannot learn. •79% of fourth graders from low income households do not read proficiently. The impact of this cycle is staggering. •Poor educational outcomes are tied to future poverty, unemployment, illness, and crime. Assistance League® of the Bay Area wholeheartedly answered this call to action. We invite you to learn about our participation and how community partnerships were key to our success. 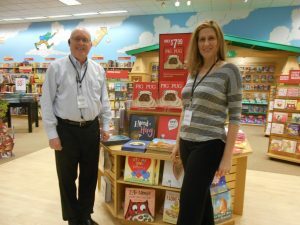 Pictured are Mark Girouard, Store Manager, and Sharon Siman, Community Partner Development Manager, Barnes & Noble Webster. Assistance League of the Bay Area continues their partnership with Barnes & Noble in Webster. Just prior to Thanksgiving and through the Christmas holiday season, Barnes & Noble Webster invited shoppers to purchase an additional book and donate it to our organization, in order to allow us to reach as many students as possible. The response was staggering, as over 1150 books were bought and sent to us for all levels of readers. These books were distributed at our monthly Operation School Bell® dressing days at area Kohl’s Department Stores and Target on Galveston Island in the months of December, January, and February. Without Barnes & Noble Webster, Assistance League of the Bay Area would have been unable to champion literacy in such an impactful way. Assisteens begin the process of labeling over 1150 books for Assistance League Action! Week. Over 1150 books were labeled by Assisteens of the Bay Area at the December monthly meeting. Sorted by location, groups worked to ensure the inside of the books reflected the chapter’s role in this initiative. Once completed, volunteers for each of the locations picked up the boxes of books to arrange for selection by participating students. The Albemarle Foundation, located in Bayport, Texas, has been a significant financial contributor to Assistance League of the Bay Area through an annual gift of $15,000 per year for the past three years. This donation is specifically for the chapter’s largest philanthropic program, Operation School Bell. 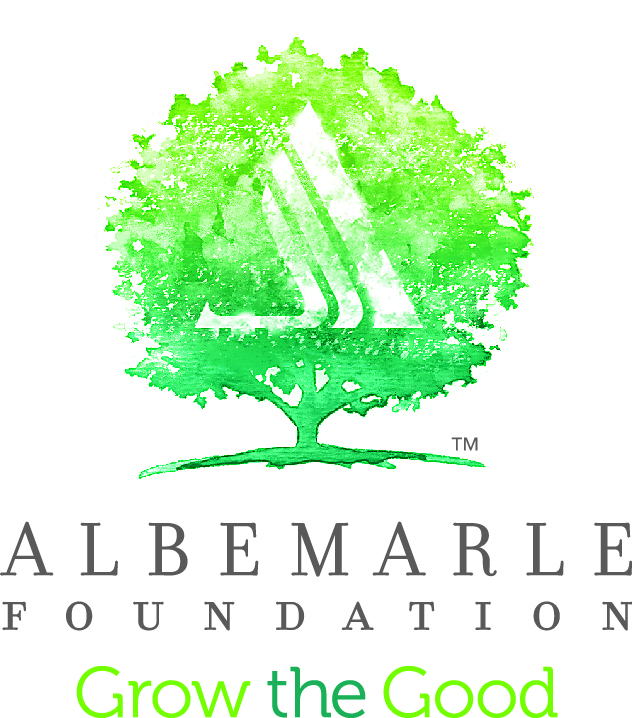 During December 2018, the Albemarle Foundation awarded the organization an additional sum of money to be used at the discretion of the chapter. A portion of those funds, voted on overwhelmingly by the membership, were allocated towards the purchase of Spanish audio books for the patients, who are simultaneously students, at the Galveston Shriners Hospital in their Burn Unit. This unexpected holiday gift allowed the chapter to expand their Assistance League Action! 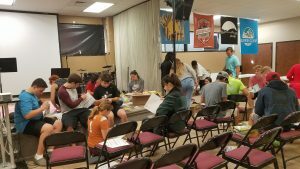 Week plans to reach students who may not have ever seen a book in their entire life. Albemarle Foundation and their continued generosity, inspires our chapter! Sisters look over the books they selected during Operation School Bell Dressing Days at Kohl's. 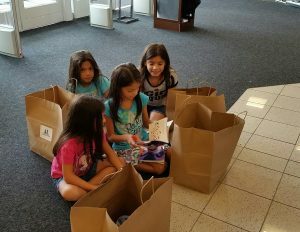 Beginning in December and continuing through February, students who were referred to three area Kohl’s locations at Baybrook in Friendswood, League City, and Fairmont Parkway in Pasadena, as well as the Target on Galveston Island, were given the opportunity to select two books when shopping for school apparel. One thousand books were placed in the hands of these students in six school districts. Each and every one of these students expressed appreciation and excitement about whatever plot line awaited them. Pictured left to right: Veronica Villareal, Classroom Teaching Assistant, Sharon Siman, Barnes & Noble Webster Community Outreach Coordinator, Myra Sanders, Classroom Teacher, Angela Bernard, Donor Development Assistant, Sarah Foulds, chapter President, and Lisa Holbrook, chapter President-Elect. 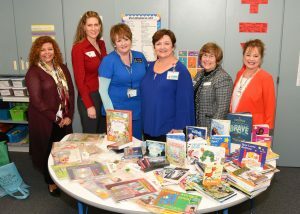 Over 150 books in print as well as Spanish audio books were donated to the Galveston Shriners Hospital’s Burn Unit for Children on Thursday, February 28, coinciding with the designated time frames for Assistance League Action! Week. Students from all over the world, but in particular Mexico, Central and South America, are brought to this location to recover from their injuries. Many of these students have never been exposed to any type of formal classroom experience. Some can not read or write. With Myra Sanders, classroom teacher, and Veronica Villareal, teacher assistant and translator, they are given the opportunity to learn. Of particular importance are the audio books as often patients spend their initial time in intensive care. These books can provide entertainment and perhaps a few moments of pain relief. Assistance League of the Bay Area is proud to contribute in a small way to their recovery.